Explore hidden gems such as Admiral Nimitz State Historic Site and The Coming King Sculpture Prayer Garden. 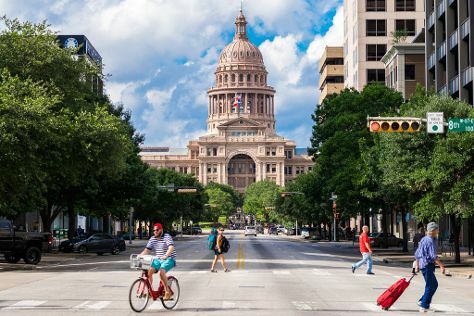 Explore San Antonio's surroundings by going to Fredericksburg (National Museum of the Pacific War & Old Tunnel State Park), Barrel Barn at Garrison Brothers Distillery (in Hye) and Landa Park (in New Braunfels). The adventure continues: take in the dramatic natural features at Natural Bridge Caverns, browse the exhibits of Guenther House, admire the architecture and history at Mission San Jose, and find something for the whole family at SeaWorld San Antonio. To see more things to do, where to stay, ratings, and other tourist information, read our San Antonio online itinerary creator. In September, plan for daily highs up to 94°F, and evening lows to 72°F. Finish up your sightseeing early on the 13th (Wed) so you can travel back home.